SIMS 8 is nearly here! These days I spend rather too much time apologising for SIMS. Not for what it can do, but for how it looks. SIMS is an old battle-axe of a system: it does what is says on the tin, it’s tough as old boots but it won’t win any awards for the good looks. Younger and newer pupil databases often look much better but often lack the functional depth of SIMS. 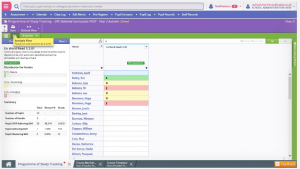 “In redeveloping the MIS, we wanted a solution that would win over the hearts and minds of teachers. 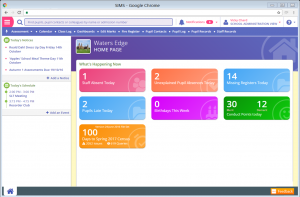 The goal was to ensure teachers would enjoy using the software, no matter what task they had to perform,” says Phil. 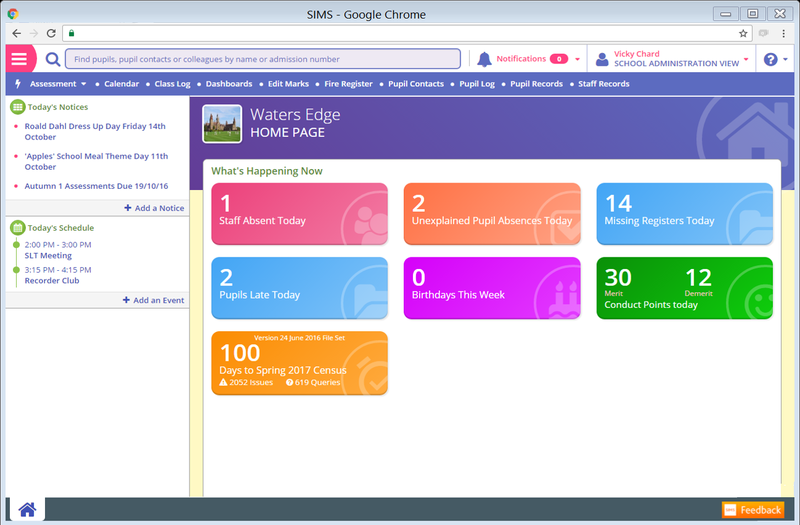 The design of Next Generation SIMS will make use of colourful dashboards, charts and proactive alerts that will be able to instantly identify when their pupils may be in need of additional support. The first release will be aimed at primary schools and will be released in early 2018. 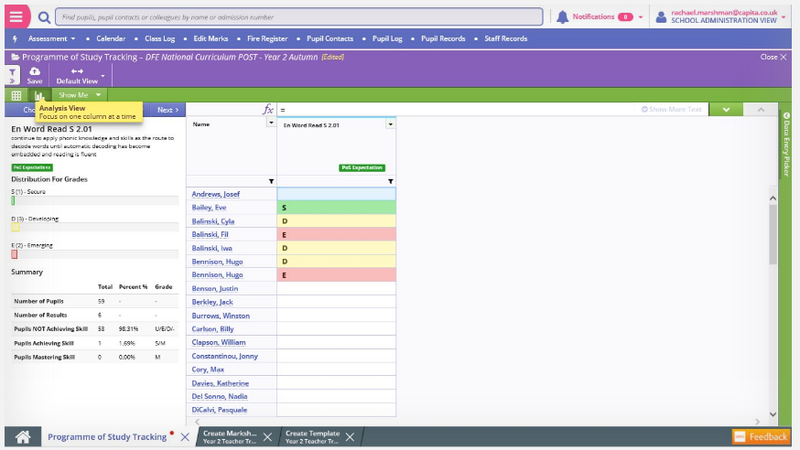 Versions for secondary and independent schools will follow as will new versions of FMS and Nova, the time tabling software. The most important change that users will notice is that SIMS will move into the cloud. What does that mean? Gone will be the option of hosting SIMS on a physical server within your school or local authority. SIMS will only be hosted by Capita in their cloud of remote servers. Instead, you’ll be able to access SIMS from any internet-connected device. So that means any tablet, phone, chromebook, laptop or desktop PC that has any internet browser (chrome, Firefox, safari even internet explorer). You no longer need to install any software on your PC and no more termly updates, no more SOLUS, no more need to backup. So long as your device has access to the internet and you have a valid SIMS ID and password, you’ll be able to access your school’s data from your office, your classroom, at home or on the beach. You won’t need to buy your own servers, you won’t need to run your own backups but you will need a reliable internet connection. Ten years ago we would have worried that school internet connections were unreliable, but most schools do have near 100% internet availability now, so it should be a major problem. Five years ago we would have worried about browser compatibility, but the new system will be written using HTML 5 so it should work reliably across browsers, IOS and android devices. Broadly speaking Next Generation SIMS will include the same functions as the current version: assessment, behaviour, attendance, census etc will all be available in the new version but Capita have held off guaranteeing the presence of every single function in the old product. It’s a chance for a new start with unused feature being ‘retired’ and new features being introduced. The pilot phase for the SIMS Primary system will run until at least the end of January 2018 with a full launch scheduled for the BETT education technology trade show at the end of January 2018. Capita are keen to stress that the current version of SIMS isn’t going to be withdrawn any time soon and will continue to be developed for the foreseeable future. But Capita can’t be expected to support both version indefinitely so some kind of a deadline is inevitable for the old version. Secondary schools will get two modules launched this year, both of them using SIMS next generation technology: a new options module with pupil and parent interfaces and a new exam results analysis module. The options module is nearly ready for release but the exam analysis module will only be released after this year’s GCSE and A Level results – to give a full 12 months for training. Assessment manager will be completely re-written. You won’t need to split a formula over multiple columns – you’ll be able to add, divide, and do a marks-to-grade formula in a single column. You’ll only be able to migrate data entry and data review columns from existing templates – the formulas in existing templates won’t migrate. 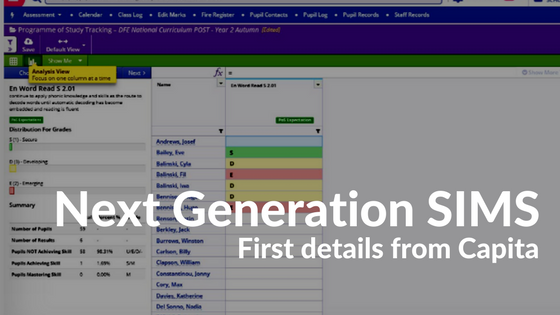 You can see from the screenshot above that marksheets will have the same look and feel as the current system. The new exam results module will probably give us a clearer picture of how the new version of assessment manager will handle data analysis. Apart from that, we’ll have to wait until Capita release more information. Exciting times! For more information direct from Capita (and a chance to sign up to Capita’s mailing list) click here.